When made part of your hood system, our Demand Ventilation control panel matches energy use to the load requirements that vary throughout the day, unlike conventional systems that waste energy by maintaining peak output at all times. 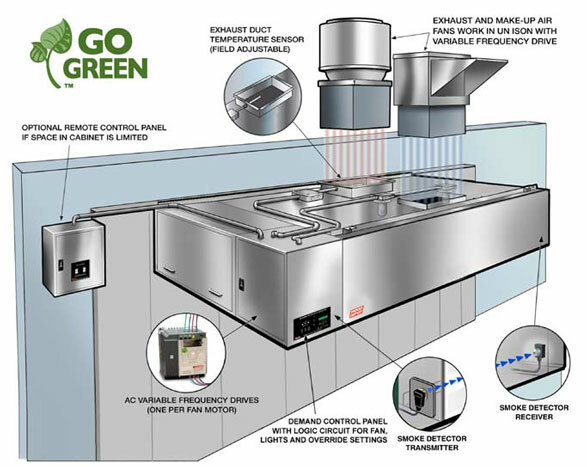 The unit’s heat-activated sensor monitors cooking operation and modulates fans during idle cooking periods, running as low as 50% during off hours to lower energy use and maximize savings. When a full cooking load begins, the sensor raises fan output to full speed. By varying the output, tempered air is exhausted and supplied as necessary, reducing the amount of conditioned air normally lost by the system -resulting in huge energy savings! If your cooking operation runs 12 to 24 hours per day, Demand Ventilation will save you money and extend equipment life!